"Journey with Wolff and Niki, an interstellar adventurer and young rebel. On a mission to rescue three stranded women from a planet no one has warned them about. Because no one has ever returned." Spacehunter opens with a cruise liner colliding with a meteor, leaving only three survivors; Nova, Reena, and Meagan. When their escape pod lands, the women are soon captured by natives. These natives take the ladies aboard a railed ship. In space, an alert goes off, grabbing the attention of Wolff and his gynoid engineer, Chalmers. Aware that their destination is a failed colony, stricken with plague and warfare, Wolff focuses on the reward and heads for Terra IX. He eventually finds a landing area and the pair continue aboard a "Scrambler." Soon, they run into a skirmish between "Zoners" and "Scavs." The Zoners manage to leave with the women, escaping with jet gliders. The Scavs explain about "The Zone" and its cyborg ruler, Overdog. Wolff returns to his vehicle, noticing Chalmers is deactivated. Eventually Wolff meets a teen Scav, Niki, and convinces her to work for him. Back in The Zone, the three women are drugged for Overdog's enjoyment. Wolf and Niki camp out, but are soon attacked by a plow. Wolff scrambles its programming, learning that its driver is his rival, Washington. Washington is here for the same reason as Wolff, but crash-landed and can't escape. Wolff denies assistance, leaving Washingon to his own devices. Wolff heads onward, fending off blobs, mermaids, and a sea serpent; even losing his Scrambler in the process. Washington catches up and with the tables turned, the men agree to evenly split the reward. The heroes manage to slip into Overdog's stronghold, making their way through numerous defenses. Wolff spots the women and forms a plan, while a bored Niki looks elsewhere and gets herself captured. Niki winds up affixed to a life-siphoner to keep Overdog functioning. This allows Wolff to jab a cable into Overdog and causing an energy feedback; destroying Overdog and his lair. The film then ends with the three heroes and the women escaping, with Wolff offering Niki the option of staying with him. 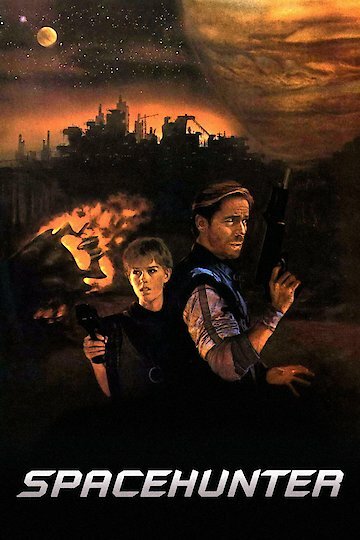 Spacehunter: Adventures in the Forbidden Zone is currently available to watch and stream, download, buy on demand at Amazon Prime, Amazon, Vudu, Google Play, FandangoNow, iTunes, YouTube VOD online.